During a Vietnam rescue mission, Hopper finds two POW soldiers (Bukowski and Thompson) who proceed to bite into Hopper’s arm. He wakes from his flashback as his wife (Jane) expresses concern about his mental health. Later, while Jane is at work, Mary calls on Hopper and makes a pass at him, but Hopper seemingly bites her stomach. At a cinema, the recently-released Bukowski takes a bite of flesh from a woman before running away and killing a biker and a security guard at a shopping mall. Hopper convinces Bukowski to give himself up and at the hospital he meets Thompson. Together they attack a nurse (Helen). Helen ‘turns cannibal’ and releases Bukowski and Thompson. Hopper kills an orderly and the together the four steal an ambulance. They kill a mechanic and some bikers before escaping into the sewer system. Helen and Bukowski are shot, and Thompson is burned alive with a flamethrower, but Hopper escapes only to see his wife killed by an infected doctor. He is then killed himself, but the virus is now spreading thanks to neighbour Mary. Although initially this film comes across as a cross between the Italian cannibal movies and Vietnam flicks, it’s main inspiration seems to come from the Vampire myth, in so far as the characters are bitten and infected with a virus that causes the victims to develop a taste for human blood. It’s actually not a bad attempt, made credible by the appearance of such genre names as John Saxon, John Morghen and Tony King from Shaft. It was allegedly made to cash in on the trend of the zombie and cannibal movies at the producers request as both Saxon and director Margheriti have since claimed that they were against including an extensive amount of gore. The gore is extreme, but not particularly well done (by Giannetto De Rossi of Zombie Flesh Eaters fame), featuring severed legs, heaps of flesh tearing, eyeball gouging and a great gaping abdomen hole caused by a shotgun blast. It was released uncut in the UK in August 1982, but has never been re-issued, even though it would probably have little trouble passing uncut these days. 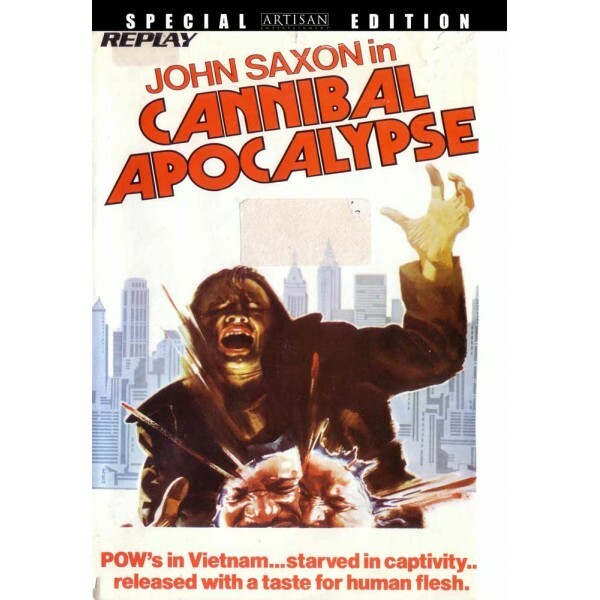 An uncut US DVD by Image Entertainment is available, but beware of a heavily censored US ‘R’ rated video going under the name of Invasion of the Flesh Hunters.